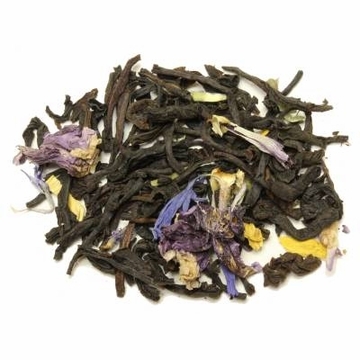 This tea is made from top grade orange pekoe Ceylon with natural black currant flavoring. The Ceylon tea is grown at the altitude of 7000 feet above sea level from the Sri Lanka region. When brewed this tea produces a bright coppery color liquid with a black currant flavor and with touches of mild astringency. A fantastic fruit tea. Black Currant is also known as Cassis. It is made into a very popular beverage throughout Europe, known for being aromatic in smell and in taste. This particular aspect of Black Currant is very evident on this tea. Free shipping with purchase over $60. This tea has great taste! Loved the flavor of the Black Currant Black tea. Not too fruity. I like to add a little to my white or green tea for special flavor. 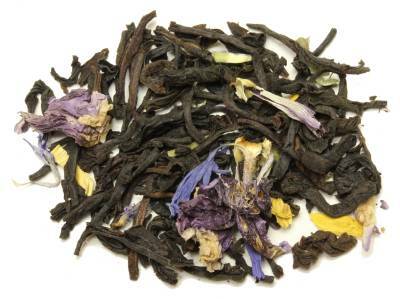 I drank Black Currant tea (black tea) from Peet's Coffee & Tea for over 30 years. Recently, in their corporate restructuring, they made several changes to their long-time products availability. Black Currant tea was dropped from their product list. As a result, I went looking for another source. Fortunately, I found this mixture from Enjoying Tea. I find it just as tasty and even slightly more fragrant than the tea I drank for so long. It is hearty and flavorful, which is what I was looking for. I drink my tea very strong with milk and honey. This tea is a great replacement for my old favorite. Having grown black currants before, I found the flavor of this tea to be right on the money. That said, black currant flavor is almost too strong alone (the berries made a fantastic jam tho). I haven't yet tried mixing this with other fruit-flavored black teas but it needs to be toned down a little for my tastes. I have no quarrel with the quality or even the flavor (it is accurate) but it is a little overpowering. Excellent tea. Crisp & flavorful with a nice fruity taste; slightly sweet and never bitter. Great on its own or with creamer or milk either as a hot or cold beverage. Even with shipping, it is cheaper for me to buy from Enjoying Tea in California (I live in Massachusetts) than purchasing from my local tea purveyor, who keeps running out of it. Highly recommend black currant tea. 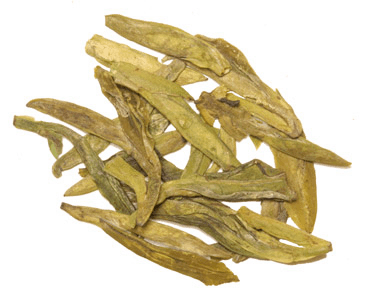 This id a very good tea, I love the currant flavor, for me it is relaxing at night. I even like to drink it chilled. Will order this teas again. My usual favorite tastes wonderful, once again. A nice black tea that's not too sweet. I tried this tea as a sample and liked it so much I ordered more. Really nice black tea flavor not to fruity just right. I've been enjoying this tea in the afternoon and have found that it is a relaxing and pleasant combination of black tea and black currant aroma. I would by this product again and I will refer my friends to your site. This makes a fabulous ice tea because of the subtle fruit sweetness. This is the only fruit infused flavor they sell at the best gourment tea/coffee place. This brand is just as fresh and good. Black Currant Tea has a pleasant taste and smell and looks lovely in a glass cannister. 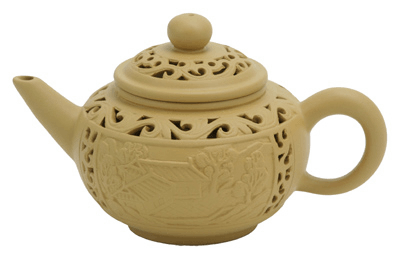 We received a small sample when purchasing a tea set and came back to order a full pound because it was so good. Give it a try; you won't be sorry! I received this as a free sample and immediately fell in love with it. It has a unique aroma and flavor and has become my every day tea. I have shared it with others in the office and they love it just as much as I do. It does not do well with a second steeping but you can steep it for a long time without getting a harsh or bitter taste. A little bit weak, you have to steep more than 8 min. to get flavor of black currant. Good point- doesn't get bitter with over steeping. It has a very original smell that bothers me a little. It's rather strong but the flavor itself doesn't resemble black currant too much. It tastes okay with a little bit of honey. I just love it, nice ,smooth taste, you can drink any time of the day. This is (so far) my favorite black tea. It has a rich, comforting flavor and it is strong enough to ensure that you are drinking a full-bodied tea. It is on the other end from, say, green tea (which I also like). I also enjoy the tangerine black tea. It's a great way to start the day! I got this as a sample in my last order and I positively loved it! I received this item as a sample and I wouldn't have really picked it on my own. When I think of fruit flavored black tea, I'm worried it will taste artificial or bitter. This tasted very natural and doesn't turn out bitter. The currants taste like an exotic berry, since I've never tried them before. Overall, fantastic.